Ahold Delhaize USA has enlisted Deliv to help provide same-day online grocery delivery for the retailer’s Giant Food Stores and Martin’s supermarket chains. Under the partnership, announced Thursday, Ahold Delhaize’s Peapod Digital Labs e-commerce arm will work with last-mile delivery specialist Deliv to enable same-day service from Giant/Martin’s stores in areas where only next-day service is currently available. A pilot in select ZIP codes in the Willow Grove, Pa., area is now offering one-hour delivery windows — up to four hours in advance — under Giant/Martin’s home delivery service, which is powered by Ahold Delhaize’s Peapod.com online grocery subsidiary. To get same-day home delivery, Giant/Martin’s shoppers in the pilot area place their order as usual through Peapod and choose a one-hour delivery window at checkout. Personal shoppers then handpick their orders. Customers can track their orders and get alerts when their groceries are on the way. Upon arrival, the Deliv driver reviews the order with the customer. Plans call for Deliv same-day service to become available at more Giant/Martin’s stores in the coming months, as well as at other Ahold Delhaize USA supermarket banners offering home delivery via Peapod. Menlo Park, Calif.-based Deliv serves 35 major markets and more than 4,000 retailers and businesses. Overall, Ahold Delhaize USA operates nearly 2,000 supermarkets in the Northeast, Mid-Atlantic and along the East Coast under the Giant/Martin’s, Stop & Shop, Giant Food, Food Lion and Hannaford banners. The company recently said it expects to provide same-day or faster online grocery access to about 65% of U.S. customers by 2020. To that end, the Giant/Martin’s, Stop & Shop, Giant Food and Food Lion chains also work with Instacart for online grocery delivery. In addition, Ahold Delhaize USA projected that it would more than double its U.S. click-and-collect locations to over 600 by the end of 2018. 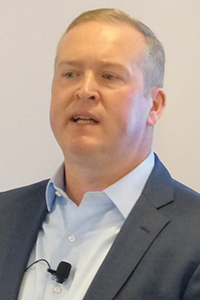 Across Ahold Delhaize USA, e-commerce sales growth is forecast to top 10% in 2018, 20% in 2019 and 30% in 2020, Fleeman said at an investors conference in November. The Peapod e-grocery service generates about $1 billion in sales and 6 million orders annually, serving customers and stores via 26 e-commerce fulfillment centers.